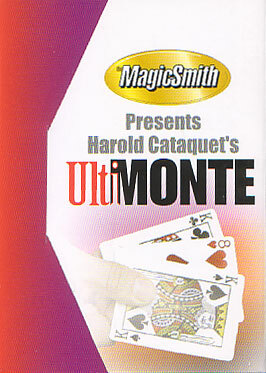 Today, when you order "UltiMonte by Harold Cataquet", you'll instantly be emailed a Penguin Magic gift certificate. You can spend it on anything you like at Penguin, just like cash. Just complete your order as normal, and within seconds you'll get an email with your gift certificate. UltiMonte by Harold Cataquet Harold Cataquet's Ulti-Monte is Three Card Monte with a sock-em-in-the-jaw finale that'll have them screaming for more! Show three cards - an Eight of Spades is sandwiched between two court cards. Shut the fan - WHAMMO! - The Eight jumps to the bottom of the packet. Just as fast as you can re-fan the cards, it's jumped back to the center! It's unbelievable and lightning quick. Do this as many times as you like - because of a hidden secret built into the Bicycle cards, they'll never suspect anything! Now for the finale - turn over all three cards in your hand and they're now all eights! They didn't see that coming! It's a slam-bam ending that your spectators will never forget. There's no technique here folks, just do the fastest fan you can (the one where the cards just squirt out from your fingers) and the magic happens! Comes with cards and very thorough instructions. Thanks for this one, Harold! Cool although it is not too practical and the skills you learn from this can only be used with this packet. I prefer impromptu, examinable but this is definitely not. Don't get me wrong, I've performed this for years and love it but don't think you can hand this out for examination. It took me some time but I finally see why the UltiMonte is good. I started practicing and learning it today. After 15 minutes of gradual step-by-step learning I got the hang of the mechanics. After another 10 minutes it was fluid. After another hour I was able to present with different patter forms. It is harder than the color monte, easier than the stand-up monte and the 3-card street monte as taught by Sal Piacente. The other reviews said what I had to say about its positivity : the ease of use compared to the greatness of the effect. I will write down what negative points I've seen up to now. The instructions that come with the cards are pretty good. They are however a little confusing in the transition between 17 and 18. All in all these are minor problems which with a little thinking can be solved. Actually it made me think on how to make the handling more fluid. All in all the instructions are given in a manner to prevent any possible mistakes. As you get better handling cards certain moves can be cut down. As with any magic this can be personalized and your patter can be inventive. It is hard to do in real life . Not recommended . I have performed this over the past several years and love it. In fact, I love this effect so much I made a video of myself performing it and handed it out to all my friends that live overseas and based on the reaction of their faces, they were stunned. It is a jaw dropping moment that the spectator will never forget. This is a definitely add-to-cart! UltiMonte is off the chain. Jive Cats don't know what hit them. It's over there, it's over here, pull it out yo underwear! Best Monte trick to date! The instructions are clear. The gimic is not dependable. It would be a great trick if it works. I should have asked for a refund but this has been sitting in a drawer for a couple of years and I just now tried it. Penguin Magic should weed out tricks that are not dependable. This is a great version of the three card monte. I only give it three stars though because it isn't that impressive to watch. Don't get me wrong, most spectators will like it but others won't care for it. It's really the ending that is the best part, but I guess that's the way it should be. If you are worrying about the secret "wearing off" pick some stuff up and you can touch them up later on if needed. I love performing this trick. Each person has to come up with their own storyline to perform it, but either way, even if you know the secret, it's fun to watch done well. It is true that after about 50 times it doesn't look as good, but if you read the instructions it tells you what you need and how to keep the trick working like new. Two years ago (2 pages back) I posted a good review of this trick. It worked fine for the first three times, but then all the cards seperate (people who perform it know what I mean) and I have to be very careful, and it doesn't look smooth at all. It maybe the set I got, but it (it being the secret) wares off. I was doing this trick with out even looking at the instructions. Its very easy to handle. Put it in the cart now.